After an excellent experience with Aiya’s Premium Gyokuro several months ago, I was unsurprised to find their organic gyokuro is similarly good, with a delicious, lasting sweetness. Organic Gyokuro is one of the rarest teas in the world. Aiya has exclusive experience working with Japanese farmers to achieve this high-level of Gyokuro which meets international organic standards. 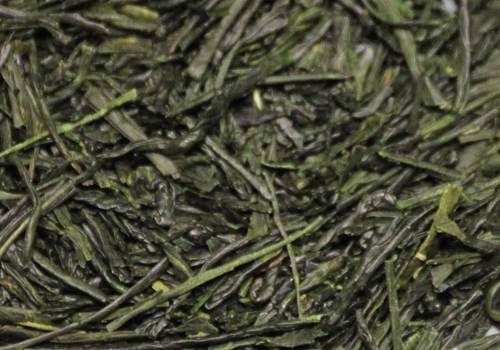 Fresh shade grown leaves are carefully handpicked to maximize Gyokuro’s natural sweetness. Given the amount of effort which it takes to create gyokuro, it’s always a delight to find a reliable source of this flavorful tea. Even better that they have it organic! To enjoy the natural sweetness of Gyokuro, use cooler water and steep it longer. Bring the water to a boil and allow it to cool to 50°C/122°F. Steep 1 heaping teaspoon (3g) of Organic Gyokuro for 3 minutes in 120ml/4 oz of hot water. With this tea, one can pour more hot water over the tea leaves and enjoy another cup. This tea has been sitting on my shelf for several months now, and I’ve been looking forward to trying it. The tea leaves are a deep emerald green, cut into many fine, spiky fragments. It has the sweet, grassy scent of a beautiful summer day. The tea steeps to a bright, clear gold, and tastes surprisingly full-bodied despite its appearance. It’s slightly sweet, with a hint of earthiness to the taste. Very satisfying! After a few steepings, it eases into a sweet, mellow taste which would be an excellent accompaniment to pastries. After a few tea sessions with this, I would warn – be careful not to oversteep or “cook” it in hot water, as this tea can get bitter. Find more information about this tea at Aiya America’s consumer shop.